How to make a contact sheet is an essential skill for students who use Photoshop. A contact sheet is a one-page document that has thumbnails of photos arranged in a grid. It is an excellent way to show multiple images in one publication. It is commonly used to show a summary of images, allowing others to choose their favorite proof from a photo collection. However, this is not its only purpose. A contact sheet can be printed. The publication can then be displayed in the school hallway or classroom bulletin board. This is an excellent way to showcase student activities or school work. As well, a contact sheet can be shared electronically. The file can be exported as either a PDF file or picture file. These can then be shared with friends or family members. The files can be linked or embedded onto a school web page, blog, or social media platform. In addition, the files can also be sent as email attachments. Prior to completing the How to Make a Contact Sheet Instructions, gather the images for the contact sheet and place them into a folder. You will want the thumbnails to be easily seen. If the purpose of the contact sheet is to showcase student activities or school work, the thumbnails should be fairly large. You may only want to include 4-6 photos. The more photos you plan to include, the smaller the thumbnails will be – making them more difficult to see. It is a good idea to plan ahead. Consider the grid pattern you intend to use. Based on this decision, select the number of photos. For example, a 2×2 grid requires 4 photos; 2×3 grid requires 6 photos; and a 3×3 grid requires 9 photos. From the File menu, click Automate. From the Use: box, choose Files. Click Browse… and go to the location of your scrapbook folder. Select each scrapbook page. Click OK. In the Document area, set the paper size. From the Mode box, select CMYK Color. From the Thumbnails area, set the Columns to 2 and the Rows to 3. At the bottom of the Contact Sheet II dialog box, decide if you would like to include the Filename as Caption. If you do not, clear the checkbox. Name the file Contact Sheet. Select Photoshop as the file type. Select Quick Export as a PNG. 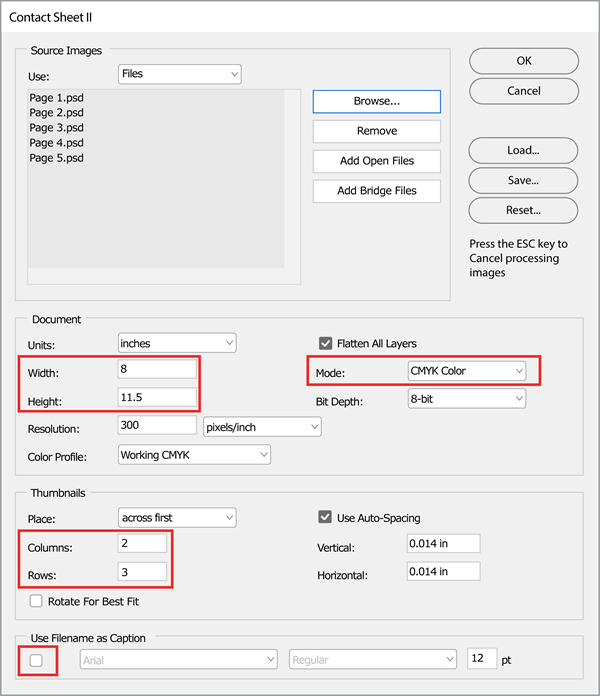 Select PDF as the file type. Photoshop has many output options. How to make a contact sheet is one option. 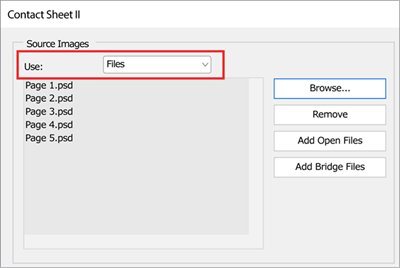 Other options include exporting a Photoshop file as a PDF or picture file. Photoshop can also transform a collection of photos into a PDF presentation with transitions or a web photo gallery. 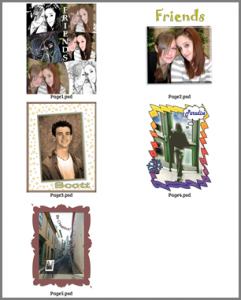 Detailed instructions are available in the technology project TechnoPhotoshop.